I am a bit smitten with holidays. Their festivity, the decorations, the themed parties, the meaning, etc. Growing up, our house was always decorated for whatever holiday was coming around. And those decorations would be up from the month's start to its finish. I'm now continuing that tradition in my own home with husband, adding new things as we go. I have so much sprucing our home to really make the holiday come to life. It creates so much excitement and anticipation for the holiday and I love that feeling. I'm most excited to decorate when we have little ones running around and they can participate in all the holiday cheer. I want to make holidays super special for them and for us. So even though we are a family of two currently, we are still making the holidays a big thing in the Hill house. I would decorate every square inch of my house if I could, but it might be overkill. When decorating, I try to use what I have and make it holiday appropriate. I love using little touches here and there for Halloween, since it's during the fall and all of that seasonal decor is already out. Apothecary jars are one of my favorite home décor items for general purposes, but when the holidays roll around, I love filling them with the perfect holiday-specifics. In this case, I found Halloween ornaments at Michael's for half off and swiped two containers of them. I always forget to include purple in my Halloween decorating, but I love the combination with orange and black. I'm glad these ornaments incorporated all of the colors, and reminded me early to use more purple this year! White pumpkins are the bees knees and I love using them as accent space fillers. You can't go wrong with them. And they bring a little something extra to your decorations. Blue pumpkins are another love of mine. I love having different seasonal colors mixed in with the holiday decor. I'm a texture nut, so the more of it the better. And those birch longs, don't you love them?! They're one of the best year round home décor pieces! If you know someone chopping down a birch tree ask for wood, you won't regret it! These DIY mason jar Halloween luminaries might be my favorite decoration this year! I can't get enough of them! Husband and I had so much fun making them, and they were the perfect finishing piece to go along the bottom of the console table. Plus, I love anything that lights up! I will be sharing a DIY How-To for these tomorrow, so make sure to come back to get a super easy craft for you and yours to make together! Can you tell what all the luminaries are?? A ghost, Frankenstein, a pumpkin, and Dracula! The banner you see hanging from my console table was a Target Dollar Bin find. Gotta love that bin and all the great little pieces they have; this one was $3 and considering I didn't have a lot of extra time on my hands to make my own, this was a great decoration to come across. I love my vine pumpkins, which were a steal from Ballard Designs this summer. Sometimes that is the best time to get holiday decorations, when the season has been long gone and the company is trying to get rid of all their excess. You might have to wait until the next holiday to display it, but the cost makes it worth it! My mantel is space that rotates decor for the holidays. When fall came around I had a leafy garland draping from it. Usually that garland stays up until the end of November when the Christmas garland replaces it. But, this year the Target Dollar Bin got me again with this Halloween bunting. I found it back in September and couldn't decide exactly where it would hang, but for $3 knew I had to have it. So I opted to take the leafy garland off until Halloween is gone and put the bunting up with a few pumpkins and little haunted house. I am so in love with the Halloween feel going on in my family room. It's so festive and makes me so darn happy! I love having all the little décor pieces lit up when dusk arrives in the evenings. It's the best! I try to decorate all of my spaces in some way or another. 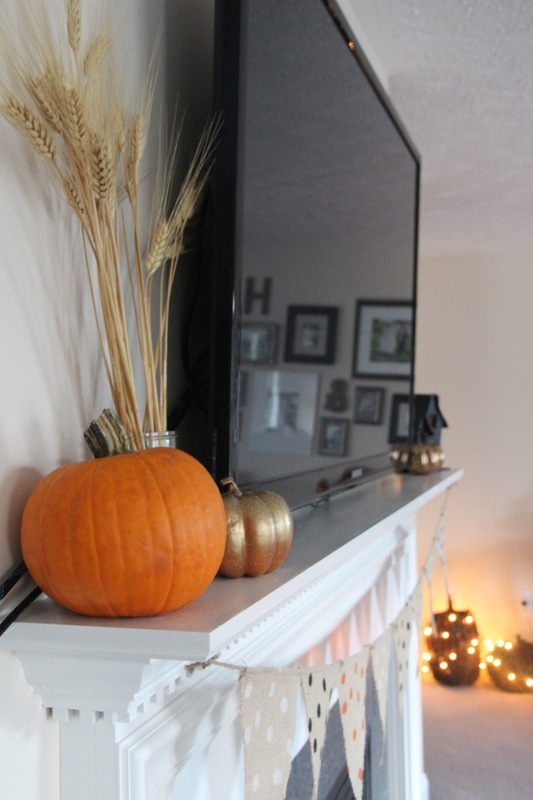 So my built-ins, which are both sides of the fireplace get a little Halloween love too. This particular shelf is sporting this oil-burning pumpkin. And you can't see it, but to the right is an apothecary jar filled with pumpkins. And this little guy is the first pumpkin I ever bought. Every fall the Lord's Acre sale comes to my hometown; it's a Saturday morning event held on a lawn in town and all the local churches come our with booths of their homemade and handmade items for sale. My top two memories of this are the ham biscuits (to die for!) and the quilts everywhere. One particular year I used my allowance to buy this small pumpkin and I've had him ever since. It's a sweet childhood sentiment and I'm happy to have it displayed in my adult, married home now. See, I've loved holidays for a very long time! All the tabletops have a bit of fall and Halloween mingled together on top of them. This little accent table is sporting my Chatbooks, a jack-o-lantern, and a Bath and Body Works candle. When making my Chatbooks, I tried to give a seasonally appropriate or holiday cover to them so that I could rotate the book displayed on top of the stack! This one has pumpkins on hay bales! Appropriate, right?! When I said all of my tabletops were decorated I wasn't kidding. This is part of my dining room table, which just about stayed the same from my fall decor, which you can see HERE. Even my kitchen as some Halloween/fall touches going on. It makes it more fun and festive to cook in a space that is holiday-spruced! These cute ghosts towels were the perfect purple addition to my décor and they were also found in the Target Dollar Bin! I'll always be about decorating the little things and this is one of those! Besides decorating outside with lights, pumpkins, and hay bales, we decorated the foyer leading up to the family room with cutout, card stock bats. Husband, my sister, and I had a night filled with pizza, Halloween movie watching, and bat making. This is the result. It's such a fun way to turn a normally bare space into something festive. They're great as you ascend the steps, going up with you. I will be sharing how to make your own bats this week, along with a cutout that I made for making some of these bats! I hope you've enjoyed my little Halloween decoration tour and that it's gotten you in a festive mood on this Monday! Be sure to pop back by this week for the DIY tutorials on making mason jar Halloween luminaries, and these bats! Also, if you love pumpkin recipes, head over to my foodie blog! I am sharing pumpkin recipes all week long and today it's Chocolate Chip Pumpkin Puffs!! So good!! Happy Monday! !